So I may be the last person on Earth to do this, but while I was packing for our trip to Atlanta for Thanksgiving, I discovered the BEST way to pack! I have always been a terrible packer. In middle school, I completely forgot to pack bathing suits for our week long beach trip. And I always overpack. And when they charge you 25 flipping dollars to check a bag, you want to pack as little as possible to cram into a carry on! So while I was deciding what to bring for my 2 week trip to Atlanta, I realized I needed to just pack outfits, not whatever tops and pants I may possibly want to wear. And for scarves and jewelry and shoes (which I usually tend to pack all that I have just in case I may need them), I needed to pair them up with an outfit so I could really see exactly what I needed. And this is the best part. I had the idea to take pictures of each outfit so when I'm getting dressed in the morning, I just scroll through the pictures on my phone, rather than digging through my suitcase and making a big mess trying to piece together an outfit! Y'all, this has simplified my life so much. I have always despised packing, but now it's so simple and kind of fun! Again, I may be the last person in the world that does this, but just in case some of you don't, I just had to share this little tip that has made my life much easier and my suitcase much lighter! I just tried this when we went to Tahoe, and it helped so much! Instead of my suitcase making it just under the 50lb mark (I still pack too much to only use a carry on! HAHA), my suitcase was lighter than the hubs!! WHOO HOO! Great packing idea! This makes packing actually fun. Stealing this for our trip over the holidays. 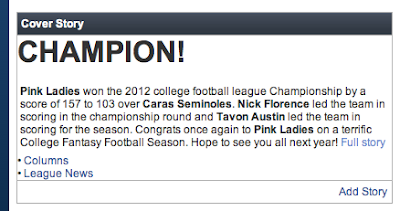 Congrats on winning your college fantasy football league! Love the name. i love this idea! 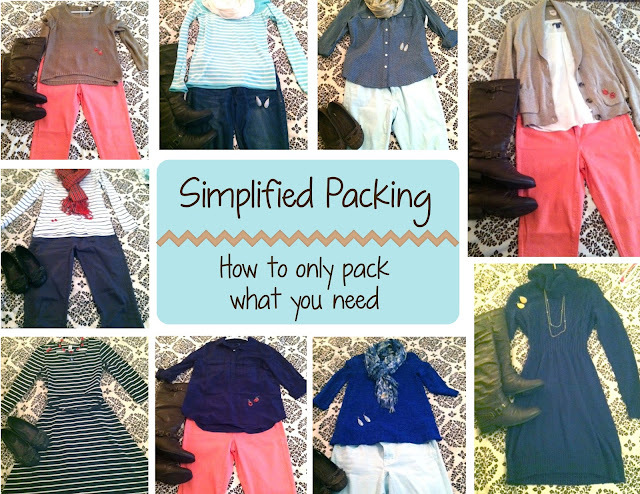 i also HATE packing, and this would make it so much less complicated! Haha I'm glad you found a way to simplify! I'm always telling J to pack like that...he always overpacks. And woohoo for beating the guys!! !